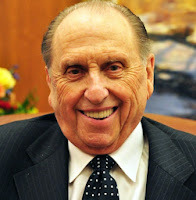 President Thomas S. Monson (b. August 21, 1927) was sustained to the Quorum of Twelve Apostles in 1963. He served as a counselor in the First Presidency with Presidents Benson, Hunter, and Hinckley until becoming Church president in 2008. "Brethren, let us examine our lives and determine to follow the Savior’s example by being kind, loving, and charitable. And as we do so, we will be in a better position to call down the powers of heaven for ourselves, for our families, and for our fellow travelers in this sometimes difficult journey back to our heavenly home." President Monson spoke only two times, and very briefly, during the most recent conference. On Sunday morning he issued a testimony and a challenge to all focusing on daily reading of the Book of Mormon. In this Priesthood session address, he spoke of the importance of kindness to one another. It's interesting to ponder his choices of topics, the things that he considered the most important and valuable to share with us now. Particularly for this address, it's sobering to recognize that a lack of kindness is a serious enough problem to merit his (and our) attention. 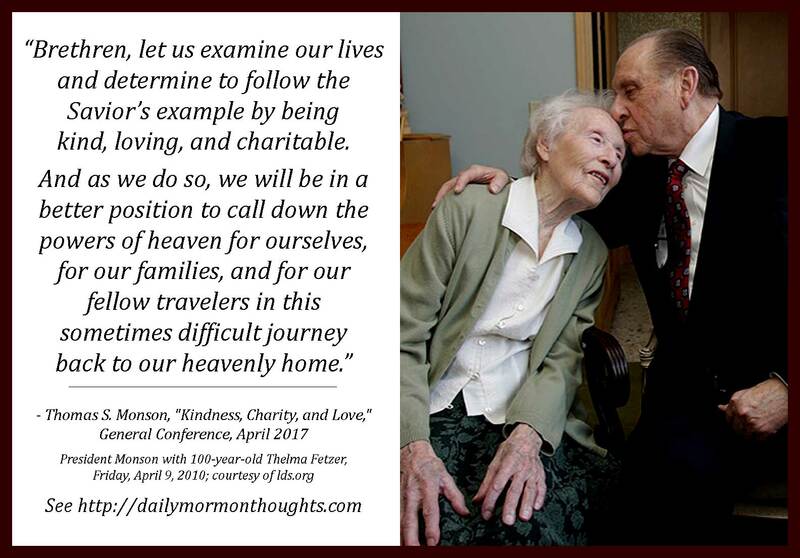 We should each ponder President Monson's words very seriously and humbly, and consider if perhaps there are ways we could express greater kindness in our interactions with those around us.